The desire to make a difference is real and beneficial. Helping, or as it is sometimes referred to as serving, is an internal motivator. That is one of the reasons doing so feels so good and is recommended within several areas of life such as in the medical field and religious arenas. Even in our careers we learn by serving others. Several studies have shown the person helping others may even realize health benefits, such as lowering stress and relief from chronic pain. Researchers are even seeing results within individuals who suffer from loneliness and depression after taking time to make a difference in someone else’s life. Personal growth is also achieved by placing our thoughts, time and energy on helping others. 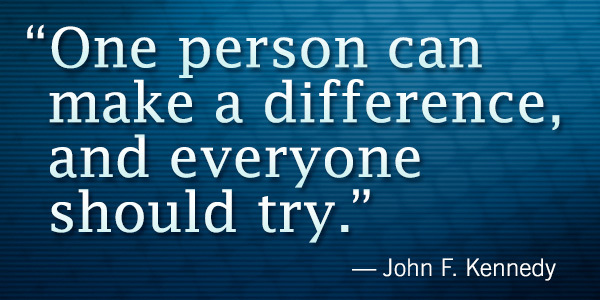 Over the years, when the topic of making a difference has come up, I have heard and seen people doubt their ability to really make a difference. Comments typically start out like this, Do I make a difference? Can I? Will I ever? Have I ever? Where am I? How Can I? Where do I? Whether we realize we are making a difference or not, we are. 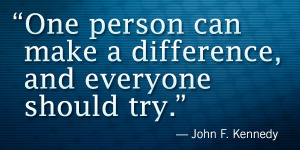 More than likely we are making a difference several times throughout our day. We get to choose the difference we make in our interactions by the way we start our days, such as the way we greet our family members in the morning or neighbors as we leave our driveways, to the way we interact with the public as we drive, shop, and work. In fact, the way we even treat ourselves makes a difference and affects others. And that’s just for starters. I haven’t even mentioned going over and beyond what is expected of each of us to truly go out of our way to make a difference. That is where the fun begins, especially when the person receiving your kindness doesn’t even know you were the one sharing with them! As I mentioned earlier, people want to help and at times they are not sure if what they are doing is worthwhile or if anyone even notices. I am here to say that yes you are making a difference and people do notice; even if they don’t know it’s you making the difference. 1- Be intentional, which requires being present where you are and with whom you are interacting. 2- Be yourself. The more we use our gifts, talents and abilities the more people see our lights shine! 3- Take an extra step to be there for others. Try to recognize the needs of others, get to know the people you are around. 3.5- Get others to join you in on the fun and give away!